Information: Io, the innermost of the large Galilean satellites of Jupiter, is the size of our moon. Voyager discovered in early March, 1979 that Io is the most volcanically active planetary body known in the solar system, with continuous eruptions much larger than any that take place on the Earth. 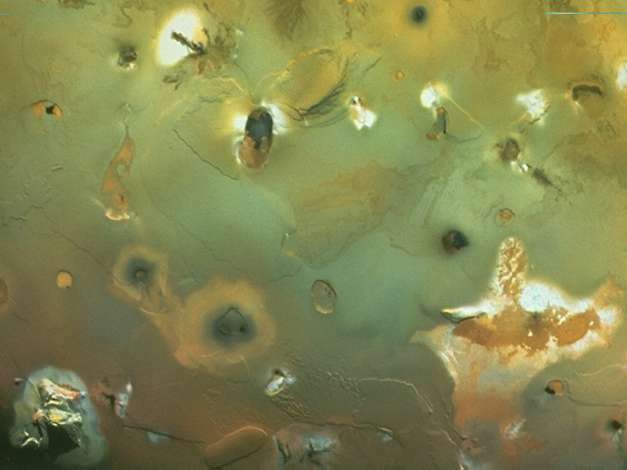 The red, orange, and yellow colors of Io are thought to be deposits of sulfur and sulfur compounds produced in these eruptions. Io's dynamic activity is a result of an orbital resonance with the nearby moon Europa that forces it into an irregular orbit. Under ordinary circumstances, Jupiter's strong gravitational pull would keep one hemisphere of the moon facing the planet at all times, but the forced irregularity causes Io to move at different velocities along its orbit, and the side facing Jupiter "rocks" back and forth. Tidal forces develop inside Io that generate heat through friction, and most of the interior remains partially molten as a result.